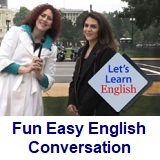 ﻿ Fun Easy English - new classroom free online classes english language lessons speaking listening writing reading march 11. 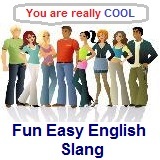 Today in the Fun Easy English classroom you are going to learn some slang beginning with the letter D.
Today learn slang beginning with the letter D.
Hey this is a really useful slang term. Basically this slang term only applies to men. 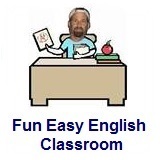 ie: He is such a dirtbag because he split up with his girlfriend. Twister - Twister is a 1996 American disaster drama film starring Helen Hunt and Bill Paxton as storm chasers researching tornadoes. In the film, a team of storm chasers try to perfect a data-gathering instrument, designed to be released into the funnel of a tornado, while competing with another better-funded team with a similar device during a tornado outbreak across Oklahoma. The following video was a scene in the movie. At the end of the video actress Helen Hunt used the slang term dirtbag. Use a dictionary to look up words you do not understand.